Taken in the Blue Room by White House photographer, Pete Souza. You can view President Obama's official portrait here. 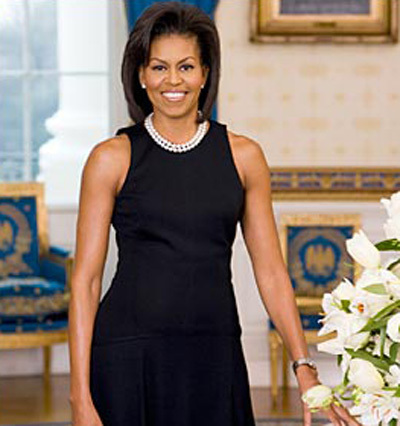 CNN talks to Michelle Obama about how she met Barack, their first date, and more. A great interview, and truly revealing re the relationship between Barack and Michelle Obama. A smashing interview with Michelle and Barack Obama by 60 Minutes. Among the topics covered by Steve Croft solely with President-elect Obama were the economy, the big 3, Guantanamo (Obama reiterated his intent to shut down Guantanamo and stop the torture), national security, Al Qaeda and Osama bin Laden, the financial crisis, and former presidents Lincoln and FDR. During Croft's conversation with both of the Obamas, they talked about their visit to the White House, the soon-to-be family dog, their resolve to ensure that the whole experience of being the children of a president doesn't adversely affect their daughters, and college football. One of the most interesting aspects of the interview for me, was the opportunity to see the interaction between Michelle and Barack Obama as a couple. But, most heartwarming for me was the realization that I had while listening to Obama talk. And that realization is that we have indeed chosen the best and most knowledgeable man to be the 44th president. I have very high hopes for this presidency, and I am eager to watch it all play out. Don't miss this interview, it is well worth watching! This interview originally aired on CBS on Sunday, November 16, 2008.